"This is really similar to the brand Oregon® Chai. Simply delicious either hot or iced! This will save you more money than buying the chai. In India, each family has their own way of making it, so you should experiment to find your favorite blend." 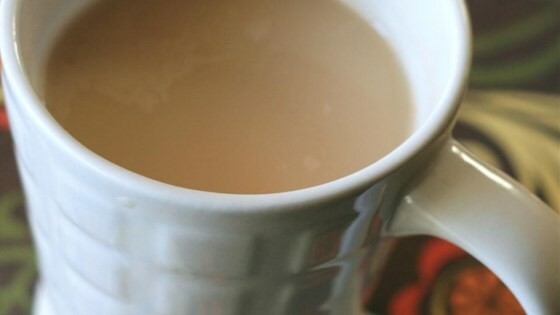 Pour boiling water over tea bag in a mug; let steep 4 to 6 minutes. Remove and discard tea bag. Stir honey and sugar into tea to dissolve. Stir milk through tea to serve. This is far too much to call it as a Chai Latte... More likely a Chai tea, with milk. I like a stronger flavored chai so I went easy on the milk, just enough to give it a milky flavor without diluting it. I also used one packet Splenda instead of granulated sugar. Very good. Good recipe. However, I added cinnamon and nutmeg. It came out a little too sweet so I boiled it and then I blended it in my blender to thicken it up. It came out perfectly!! !